In anticipation of its busiest travel week of 2012, Amtrak is adding more trains between Chicago and Michigan for Thanksgiving week. The passenger railroad encourages passengers to plan ahead for Thanksgiving travel and book their tickets now for best availability and pricing. The busiest travel days that are likely to sell out are the Tuesday and Wednesday before and the Saturday and Sunday following Thanksgiving. Passengers can also consider traveling on less-busy days such as the Monday before or the Friday and Monday following the Thanksgiving holiday, when more availability and price options could be available. Amtrak will offer two additional eastbound and one additional westbound Wolverine Service trains between Chicago and Kalamazoo/Ann Arbor, Mich., on Thanksgiving Eve, Nov. 21. 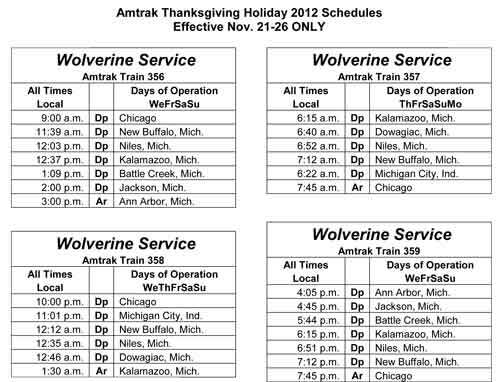 Amtrak will operate two additional Wolverine Service round-trips daily between Chicago and Kalamazoo/Ann Arbor on Friday, Nov. 23, on Saturday, Nov. 24, and on Sunday, Nov. 25. Amtrak ordinarily offers three daily round-trips through Ann Arbor and four daily roundtrips through Kalamazoo, with all these trains operating at top speeds of 110 mph through parts of Indiana and Western Michigan. Please see the schedules below for the special added trains 356-359. Check www.amtrak.com for a complete schedule of all available trains for these dates. In preparation for the anticipated heavy holiday passenger volume, Amtrak will also operate every available passenger rail car in its fleet and is scheduling extra trains to accommodate additional passengers in the Northeast, Midwest, and on the West Coast. More than 724,000 passengers traveled on Amtrak trains for the Thanksgiving holiday in 2011, the most ever for the holiday. Amtrak announced last week it carried more than 31.2 million passengers in the 12 months ending September 30, marking its highest-ever ridership.